War is tough. You'd be hard pressed to find a war film that didn't try to evoke some of the horrors or stresses of combat. The characters of The Hurt Locker have a more stressful job than most. They comprise an elite US Army bomb squad unit, charged with disarming bombs laid by insurgents in the sandy streets of Baghdad. For their fearless (or is that reckless?) leader, Staff Sergeant William James (Renner), this stress is a veritable amphetamine, and he's well and truly hooked. 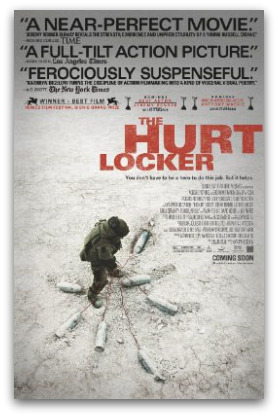 The Hurt Locker boxes the intensity of his adrenaline-chasing experiences into a 131-minute study of the psychological impacts of war. The scene for James' exploits is set during a tense prologue, in which his predecessor in Bravo Company, Staff Sergeant Matt Thompson (Guy Pearce), is killed when a routine operation takes a dire turn. This leaves Thompson's chums and offsiders, Sgt Sanborn (Mackie) and Specialist Eldridge (Gerahhty), decidedly shaken. James is brought in to replace him, and is immediately seen to be clearly different from his steadfast predecessor. During one of his first operations with Bravo Company, an attempt to disarm a car bomb, James discards his communication earpiece and ignores advice to abort. The mission is successful, but Sanborn's and Eldridge's astonishment at James' recklessness is exacerbated by the recent memory of the reliable Thompson's death, and Sanborn even responds with physical violence. Violence, and alcohol, later fuel the strained camaraderie of the trio. We see them, between operations, bonding during a binge in the barracks, belting each other in the stomach and laughing drunkenly. It's a macho ritual that suggests they have been physically as well as mentally desensitised by war. We are given more insight into the extent of James' addiction; Sanborn discovers a basketful of bomb parts, souvenirs from successful jobs, under James' bed. This is an apolitical film. The soldiers are not heroes, but they do have a job to do. We are made to appreciate the psychological demands of military operations in civilian areas. There is a moral obligation to preserve civilian lives, but also an inevitable and necessary concern for personal safety. Most of the civilians pose no threat to the soldiers, but some probably do (a hard lesson learned at the time of Thompson's death). The film's account of warfare is at times tryingly forensic. We spend a long afternoon in the desert during a gunfight with insurgents. It is no high octane shoot-'em-up action showpiece, but the kind of battle where a shot fired from a long-range weapon in one location is followed a moment later by a spray of dust — or puff of blood — in the other, seen only through shaky binoculars. The scene evokes the monotony and mental strain of warfare, but also the inevitable bonding that must occur between soldiers. There's a near-tenderness, for example, to the way James and Sanborn share a juice-box to clean the claggy sand from their mouths. They are not friends, but they are both soldiers, and human. The film has its share of humanity and of horrors. James bonds with a young Iraqi boy, Beckham (Christopher Sayegh), whose good-natured trash talk wins a smile and even fondness from the soldier. But war, of course, destroys good things. Their budding friendship foreshadows the most horrific moment in the film ('Have you ever seen a body bomb?') which in turn pushes James closer than ever to the edge of self-destruction. It seems that in recent weeks most coverage of The Hurt Locker also mentions James Cameron's $300 million-plus piece of eye candy, Avatar. That's because both films have dominated the awards season, and each is nominated for an impressive nine Oscars, including for Best Picture and Best Director. It is not unlikely that Avatar will emerge the victor, if only by dint of its sheer scale as a technical achievement and of its enormous box office success. The Hurt Locker is a smaller film in just about every respect, from its budget ($15 million) to its running time. Nonetheless in the depth of its characters, its explosive emotional impact and its unforgettable realism, it is a superior film. Insightful commentary. I saw the movie today but fortunately I deferred my reading of Tim's analysis just in case he revealed too much of the plot - and that is what he did. In Dickens' Barnaby Rudge, pet raven Grip is given to tantalising but incomprehensible pronouncements, fluttering annoyingly around the edges of conversational gatherings, and launching sudden, inexplicable attacks.